The toughest NHL player ever died on Friday. Here's the story of how a 1959 Oldsmobile brought him to tears. Gordie Howe, the greatest all-around hockey player of all-time, died on Friday evening. The Detroit Red Wings legend had been in declining health for some time. He was 88. Sift through the obituaries and tributes, and you’ll see his stats. Twenty-three NHL All-Star games. Four Stanley Cups. Six times winner of the Hart Memorial Trophy, the NHL’s most valuable player award. More goals than any player ever, save for Wayne Gretzky. Howe’s career spanned more than 2,000 games over six decades. It included some pretty incredible moments. 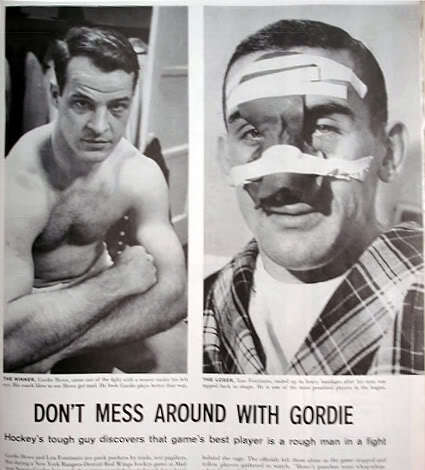 The Oldsmobile episode came less than a month after he famously beat New York Rangers defenceman Lou Fontinato into the hospital. Like all the greats, Howe contained multitudes. He will be missed.